thebakerwhocooks.net | Teh Tarik Secret! I wrote briefly about my virgin visit to Mustafa a few weeks ago. I also mentioned about some tea that I discovered. It’s no ordinary tea – well to me at least. I’ve been searching high and low for this tea! I know it might seem like a silly endeavour but really, I’ve been quizzical for the longest time and now I have finally found the answer. Answer to what you might ask. Hmmm…. well you’d know if you’ve drank teh tarik. I believe that almost every local would have drank it once. For the uninitiated, teh tarik translates into ‘pull tea’. It’s basically tea that’s been mixed by ‘stretching’ it from a great height. Think of it as a ‘juggling’ act – except that the key object involved is the liquid a.k.a. the tea! hahaa…. Anyways, yes, I like teh tarik and I know that they use a very special tea. How do I know? Well I’ve tried using the usual Lipton teabags and I don’t get the same taste and colour. Seriously, I have been really puzzled. Have any of you ever wondered the same? Ya know… like where in the world did they get their tea from? One main reason is because I wanted to make my own at home whenever and wherever. So while at Mustafa, I checked out the tea section and searched high and low…. 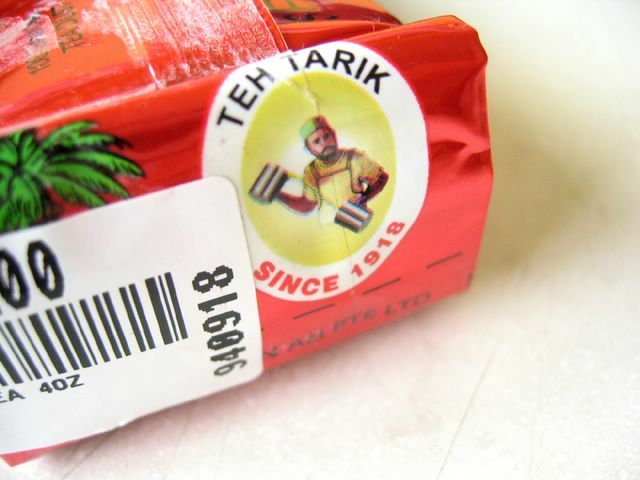 Haha… Teh Tarik Since 1918! I assumed then, that it meant that this tea has been used to make teh tarik since 1918. Now that’s alot of history and it probably is a damn good brand… or rather, the makers of the tea are good at what they do. Care to know what brand it is? Look closely because I think the spelling mistake is pretty obvious. But then again it could have been done on purpose yea? You decide! 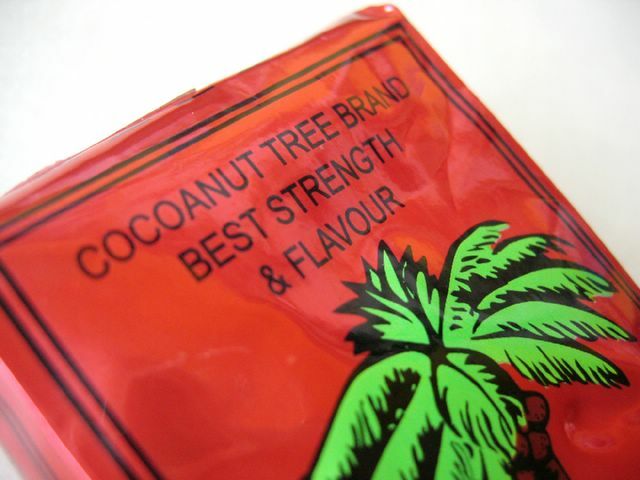 “Cocoanut Tree Brand Best Strength & Flavour”! Hehe…. I was really excited. This small packet put me back by a mere $1. It’s really cheap! I didn’t dare buy a bigger pack for fear that it wasn’t the real deal. But now that I know, I’m so gonna go back there to get a bigger pack! I’m really happy. I’ve made teh tarik with this tea and am pleased to report that it really does taste, smell and look like the actual teh tarik they sell outside! I’ve been making alot of it… nice comfort drink especially when you need some caffeine to keep you awake while studying really hard for that exam… heh, like ME! All right… back to my books! ciao! Yay! For teh tarik or if u can help it, never use tea bags as they contain only tea dust. I use teh boh for my teh tarik! Works wonderfully good!! caffeine – definitely, u can mention it again. this brew is bloody poisonous! nice blog u have here. u’re bookmarked! Sorry for the above. YOu can use any kind of ceylonese loose tea leaves for teh tarik. Well, I got some from Mustafa this AM – wonderful place, can go at 3AM if you want. I then asked an Indian Muslim friend of mine. And he said “You can use any tea for teh tarik but it does not taste the same – you have to use this type of tea to get the real teh tarik taste”. I have tried Boh tea (not the bags, the leaves) and I use 3 teaspoons for 150 ml of tea and still it does not have the teh tarik kick. I must remember to buy some of these when I am back in Singapore. Thanks for sharing with us your good find! a good concoction of teh tarik will include a strong dosage of ceylonese tea, evaporated milk, condensed milk n sugar. i usually soak the tea with hot boiling water in a stainless steel mug n pour it into a cup which already has evaporated milk, condensed milk n sugar. somehow the teh tarik will taste better this way! Thank you for all the posts. Born and raised in Seremban, but currently living in St. Louis, Missouri. Bought the teabag version of Mustafa’s Teh Tarik on a recent trip to Perth…and DO I REGRET not getting a suitcase full of it!!!! Yes, definitely tastes like the real stuff, and no… ordinary tea Ceylon or otherwise just won’t do. I’ve searched high and low for teh tarik (bag or loose-leaf) in the US with no avail. If someone could at least enlighten me as to what the ‘secret ingredient’ is…if any… I would be much obliged. Yes, it does smell like it has Cocoa in it, but the brew doesn’t appear cloudy like any chocolatey drinks that I’ve seen. 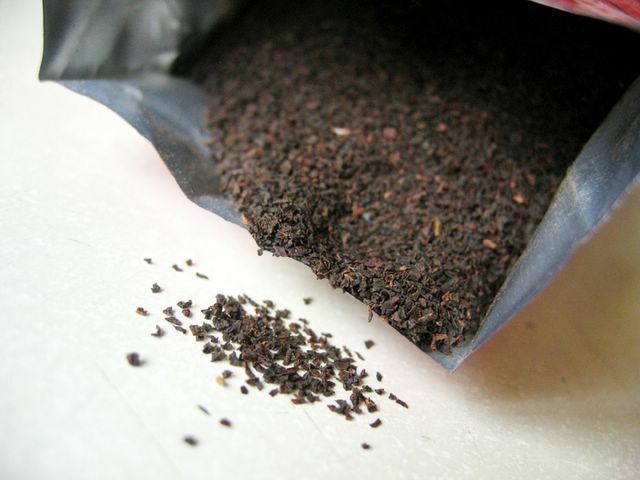 Ceylon tea is often used for teh tarik. you should try masala tea next! Really? Love to! What is a good Masala Tea?